How Will State Budget Cuts Affect the Homeless in Baltimore? MEGAN SHERMAN, TRNN CORRESPONDENT: Baltimore’s homeless aren’t just facing challenges from the freezing temperatures this winter. Advocates are worried about potential cuts to services that they rely on to survive. LEANA WEN, DIRECTOR, BALTIMORE CITY HEALTH DEPT. : We’ve had six deaths this season alone because of hypothermia. SHERMAN: Maryland’s Republican governor Larry Hogan has proposed a 2 percent statewide spending cut. Though the vast majority of funding for homeless services comes from the federal government, advocates fear the cuts will disproportionately impact financially vulnerable populations like the homeless. TONY SIMMONS, WORD ON THE STREET: They always cut the budget from the bottom. It’s like a tree: you cut the tree for the bottom, you tumble the whole tree. SHERMAN: Parallel events happened two decades ago when then-Governor Parris Glendenning’s 1995 budget eliminated $35 million for disability assistance and medical care to close the budget deficit. The impact was immediate. Within two months, the move had correlated with a 65 percent jump in homelessness, according to a survey conducted by the Downtown Partnership Business Association. Tony Simmons is an advocate for the homeless who was formerly homeless himself. He works for Word on the Street, a local independent newspaper that reports on issues that affect the homeless population. He says Hogan’s cuts could impact food stamps and Medicaid. SIMMONS: It’s going to affect the quality, ’cause the shelters are going to claim they don’t have the budget, the don’t have the money anymore, so they’re going to have to cut back. So when they cut back, who are they going to cut back on but people who can’t afford it? SHERMAN: Advocates also worry that there won’t be enough funding allocated for homeless services due to the method that the mayor’s office uses to count the number of people experiencing homelessness. In 2013, the city found that there were over 2,600 people on the streets each night and about 30,000 people who will experience homelessness annually. The Mayor’s Office of Human Services did not respond to multiple interview requests. 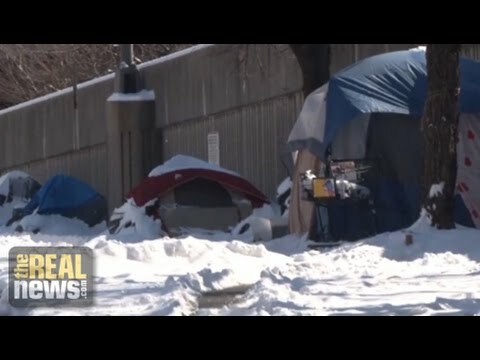 We did speak with Councilman Eric Costello of the 11th District, who participated in the city’s most recent homeless census, conducted in January. He said that the count is critical, because it’s used to determine funding for services like shelter beds. ERIC COSTELLO, BALTIMORE CITY COUNCIL, 11TH DISTRICT: I think it gives us a better idea in general of what the population is. Without knowing what the population is, from a budgetary perspective we can’t adequately prepare and plan to provide services. So I think it’s a key piece of the puzzle. SHERMAN: Adam Schneider, the director of community relations at Health Care for the Homeless, a local nonprofit organization that provides emergency shelter and health care services for hundreds of people, explains why the city’s count is inaccurate. ADAM SCHNEIDER, DIR. OF COMM. RELATIONS, HEALTH CARE FOR THE HOMELESS: Every two years, the city counts the number of people who are homeless on any given night. But that count is always an underestimation of the need, right? On any given night, maybe three or four thousand people might be counted, but that doesn’t include all of the people who aren’t counted, who are staying in abandoned buildings. It doesn’t count the people who are in the most anonymous shadows of society. It doesn’t include the people who are doubled up or tripled up. It doesn’t include the people who may have a place to stay tonight but may not have a place to stay tomorrow night. SHERMAN: The Mayor’s Office of Human Services allocates approximately $40 million a year to services for those who are poor and housing-vulnerable. This funding helps to provide an array of different resources for individuals experiencing homelessness, such as soup kitchens, shelters, and transitional housing. WEN: Cold weather is just as dangerous as extreme hot weather. Mayor Rawlings-Blake made sure that during our time of extreme cold, that we had shelter for all the individuals who needed shelter, especially our homeless individuals. And we had outreach workers making sure that we can then transport our homeless population to our shelters. And that’s something that we very much encourage people to do, to watch out for cold-weather emergencies. SHERMAN: Even with 18 shelters, many wind up squatting in abandoned houses and putting up tents as a means of staying warm. Local community advocate Kim Trueheart says some avoid shelters due to concerns over safety. KIM TRUEHEART, ACTIVE CITIZEN: In going around talking to them, I ask them, will you please consider going to the shelter? Can I take you to the shelter? You know, shelter’s right around the corner. And universally the answer is no, I don’t want to go into the shelter, because they’re not safe places. SHERMAN: Schneider believes there are a number of factors that enter into the dozens of people in the streets each night. SCHNEIDER: First and foremost, the shelter system is inadequate. There just aren’t not enough shelter beds for people. People are turned away every night from shelters. Oftentimes people have behavioral health conditions that are not easily managed in shelters, people who have anxiety disorders, for example. Being in a place with 275 people you don’t know is not going to be a very easy place to manage one’s anxiety. People have been mistreated sometimes at shelters. People have loved ones that they want to be with, partners with whom they are trying to manage some of the worst experiences that you can imagine, and then to be told, well, you guys can’t stay here together. SHERMAN: Kim Trueheart also spoke about a bill that she is working on with Baltimore state delegate Jill Carter which will address the issue of safety in the city shelters. TRUEHEART: And so the legislation really tasked the state agency that receives most of the homeless funds, which is the Department of Human Resources, to do a study, to look at this issue, come up with recommendations to implement in these contracts that require the operator of the shelter to develop a safety and security plan. We have a responsibility to make these shelters safe, because most of these facilities that receive tax dollars are under contract to operate it. So if you’re supposedly operating a facility, it ought to be safe. SHERMAN: While emergency services like shelters are critical for those in need, they don’t address the root causes of homelessness. And some say until those reasons are addressed, homelessness will persist. SCHNEIDER: Fundamentally, shelters aren’t the solution, right? I mean, shelters are part of an emergency response. But we shouldn’t see shelters as any kind of solution to homelessness. The solution to homelessness is housing, the solution to homelessness is ending poverty, the solution to homelessness is ensuring that everybody has the health and supportive services that they need to remain housed. That’s how we end homelessness, not through shelters. SIMMONS: Housing First, it works. It’s been done all over the country. People have been housing the homeless and then helping them once they’re housed. I mean, Housing First works. And if we try that here in Baltimore, it will work. So on a state, federal, and local government, let’s try it. Let’s get them off the street and see where we can go from there. SHERMAN: Community members are organizing a sustained effort to pressure the legislature to overturn the cuts. The Real News will continue to follow up on this story as it develops. This is Megan Sherman reporting with The Real News Network.